What happens to the waste that is not placed in a recycling bin? In most waste management procedures the mixed material is placed on a conveyor belt for pre-sorting. Firstly, materials that can’t be recycled are removed by hand. This can include metals, carpets, concrete blocks and even large plastic sheets. Anything that could create damage if they are allowed to remain in the mix. Cardboard is also removed, but there is a market for recyclable cardboard and it is set aside for further processing. 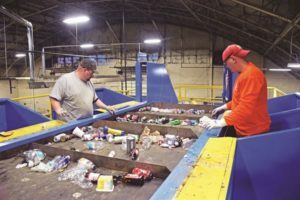 The next stage involves automatic sorting which separates the materials into three separate waste streams. Here contaminated paper will automatically be separated from the recycling stream and plastic bottles and clothing are also separated. At another stage, a magnet removes aluminum cans. Mechanical waste management procedures are not perfect and now waste management employees are stationed at the belt to extract any problematic items that the mechanical belts may have missed. These can include small bits of plastic and clothing or shredded paper. These bits of waste are not practical for an automated operation. These employees serve as the last stage of quality control, the cleaner the product the more valued it is for the recycling market. The recovered paper is stored in a bunker awaiting shipment to a paper mill that will reprocess the material. Ferrous and non-ferrous metals are baled and stored in bunkers as are cardboard and plastics. You can learn more about the waste to energy process at Energy Recovery from the Combustion of Municipal Solid Waste (MSW).